A Space Force like the one ordered by President Donald Trump could potentially help defend Earth against future asteroid impact threats. Here, Trump addresses troops at Miramar Marine Corps Air Station in San Diego on March 13, 2018. If a military Space Force like the one proposed by President Donald Trump becomes a reality, odds are, it would play a role in defending Earth from an incoming asteroid. In a report released today (June 20), NASA and other federal officials unveiled what the United States should do over the next 10 years to safeguard Earth from potential asteroid impacts. That 18-page plan, called the "The National Near-Earth Object Preparedness Strategy and Action Plan," would involve work from agencies across the federal government, White House officials said — even, potentially, Trump's proposed Space Force. While Miles did not mention the Space Force by name, it stands to reason that any national concerted effort to defend Earth from an incoming asteroid would involve at least some military assets in space for asteroid tracking or deflection. And if a Space Force is in service at that time, it's likely to play a role — after all, the Air Force already works hard to maintain space situational awareness of objects orbiting Earth. A "gravity tractor" that would park a spacecraft near the asteroid and let the gravitational attraction of the two objects nudge the asteroid off course. A "kinetic impactor" that would slam a spacecraft into an asteroid to knock it off course. A nuclear strike aimed at vaporizing the surface of an asteroid, creating jet of material that would push the asteroid off course. All three of those options would require at least a 10-year lead time before a potential asteroid impact, NASA Planetary Defense Officer Lindley Johnson told reporters at the teleconference. And all could be accomplished with robotic spacecraft rather than astronauts. This graphic depicts the spatial extent of the damage if an asteroid measuring roughly 100 feet (30 meters) wide were to hit New York City. An asteroid that size famously exploded over Siberia on June 30, 1908. Known as the Tunguska event, this was the largest asteroid impact in recorded history. 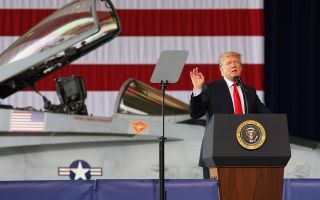 This week, Trump ordered the Department of Defense to form a Space Force as the sixth branch of the U.S. armed forces. (The other branches are the Air Force, Army, Navy, Marines and Coast Guard.) The Space Force, which would have to be approved Congress, would oversee U.S. military operations in space, much of which is currently managed by the Air Force. But while it's likely that a Space Force, if one ever exists, would play a role in the U.S. asteroid-response plan, NASA would also be heavily involved. The space agency's proposed 2019 budget calls for $150 million in funding to support asteroid defense, Johnson said. Those funds in 2019 would support NASA's planned Double Asteroid Redirection Test (DART), a mission that would launch in December 2020 to visit the near-Earth asteroid Didymos (and its moon, nicknamed "Didymoon"). DART would crash into Didymos to test an asteroid-deflection technique called "kinetic impactor," which essentially slams a projectile into an incoming object. And then there are efforts from the international community, because a major asteroid impact would pose a threat to the entire Earth, not just one country. The European Space Agency, for example, has drawn up plans for a companion mission to NASA's DART that would send a probe to the asteroid Didymos to watch as DART hit the space rock. "It's a global hazard that we all face together," Miles said, adding that international collaboration is one of the five major goals of the new action plan. Johnson even suggested that civilians, like amateur astronomers or the B612 Foundation for asteroid awareness, could play a response role. "Planetary defense is a team sport," Johnson said. "We welcome capability wherever it comes." You can download the full National Near-Earth Object Preparedness Strategy and Action Plan here from the White House Office of Science and Technology Policy.